"The attached photograph by G.H. Wilkinson shows a Midland engine buffering up to its train. The fireman seems to be standing on the front of the engine (his cap can just been seen behind the smokebox) directing the driver, whose hand is on the regulator, while a well dressed gentleman looks on. The station, however, is thought not to be Midand but LNWR (n.b. the lamps), and is likely to be the terminus of a suburban run in the Birmingham area. Date is about 1900." 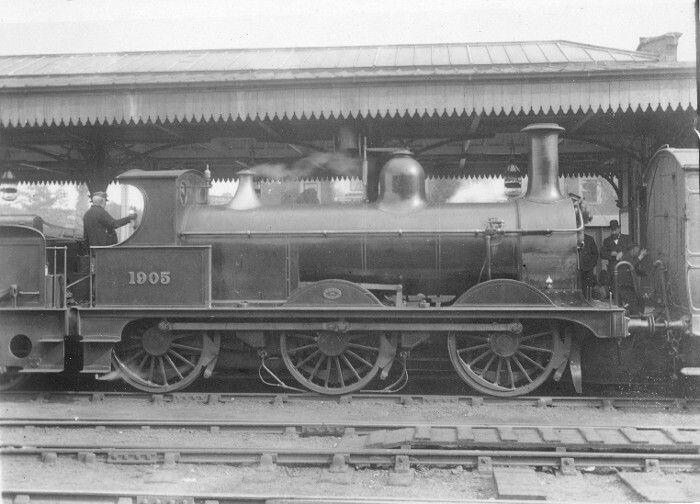 As Ted Talbot remarks this is a Midland Railway loco, a Johnson single-frame 0-6-0 (Class 2) as built as one of a batch of 100 by Neilsons in 1890/1, and hence known as "Neilson Goods", although some were regularly employed on passenger trains. As it bears its original number the date must be before 1907. The engine is in the fully-lined crimson lake livery. For more information see An Illustrated History Of Midland Railway Locomotives Volume 4, by Essery and Jenkinson. I think the location is Walsall, which saw both LNWR and Midland trains. The engine still has the pre-Clearing House standard arrangement of lamp brackets - note two on the left and one on the right of the buffer beam. This would give 1902 or earlier for the date. I don't think this can be Walsall. The saw-edged roof valance is a different pattern to that on several photographs of Walsall, and what can be seen of the background doesn't fit. The background also rules out Wolverhampton - by the sun's position the photo would have been taken at the north end, with the lower-level GWR station behind. On the slim evidence of one photograph taken in 1951, which shows a station roof like that seen here, I suggest the mystery photo might have been taken looking across the four tracks between the platforms, at Hereford. My identification of Walsall was based on a photo in P.B. Whitehouse's book The LMS In The West Midlands, plate 56, but looking closely I agree that although it is not exactly the same it is very similar, but it shows a different part of the station. However, the caption to plate 56 of a "Walsall to Dudley" train cannot be correct as the train is standing on the wrong line (might be Dudley to Walsall). There were three tracks between the platforms at Walsall on one side (Down Slow, Down Middle and Up Slow) which complies with Mystery Photo 98. But Hereford is hardly "the terminus of a suburban run in the Birmingham area". With reference to this picture, the houses behind the Station are in Barrs Court Road, Hereford. I would think that the engine would be working on the Hereford to Brecon Midland Railway line.